I have a new nemesis. He has been taunting me almost daily for the last two weeks. I guess this whole saga started back in the spring when I planted sunflowers to fill in some gaps in the landscaping. They blossomed about a month ago and the backyard wildlife has been going crazy over them. The bees are all a-buzz, and there's a big pile of seed hulls on the porch where a squirrel stuffed its little belly. But I don't care about the bees or the squirrels... I care about the one little American Goldfinch who has been avoiding my camera for two weeks. Every evening he hangs out in the sunflowers until I come home from work. He sees my car pull into the driveway and watches me as I dash inside to grab the camera. Then, just as I'm about to take the photo, he laughs maniacally and flits away into the backyard tree line. The most frustrating encounter was when I spotted him hanging upside down from one of the sunflower heads... it was such a perfect image with the bright yellow finch framed by the bright yellow sunflower petals. But of course he took off just before I could get the photo. I caught him just once when he paused briefly to rest in the neighbor's yard, but couldn't get my camera to focus before he got away. 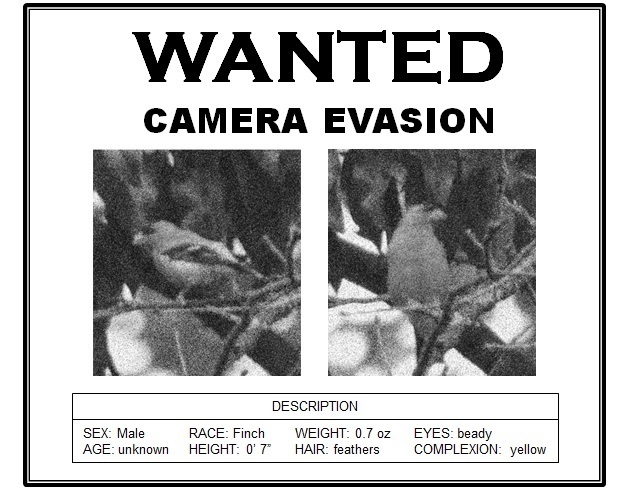 I used the blurry photos to make this wanted poster. Keep your eyes peeled.